TODAY's Al Roker tracks Tropical Storm Isaac as it swirls in the Atlantic and discusses whether or not the Republican National Convention in Tampa, Fla., will be plagued with heavy rains and high winds. Forecasters are keeping a wary eye on Tropical Storm Isaac, which developed in the Atlantic Ocean on Tuesday and poses a threat to Florida during next week's Republican National Convention in Tampa. National Hurricane Center computer models Tuesday predicted the storm would grow into a hurricane over the next few days. Some models had the storm striking Florida or passing close after moving across Cuba as early as Sunday. The storm late Tuesday afternoon was about 500 miles east of Guadeloupe, the Hurricane Center reported. It packed sustained winds of 40 mph and was moving west at 17 mph. Tropical Storm Isaac moves westward in the Atlantic Ocean less than one week until the Republican National Convention in Tampa, Fla.
A tropical storm warning was in effect for Martinique, Dominica, Guadeloupe and surrounding islands. 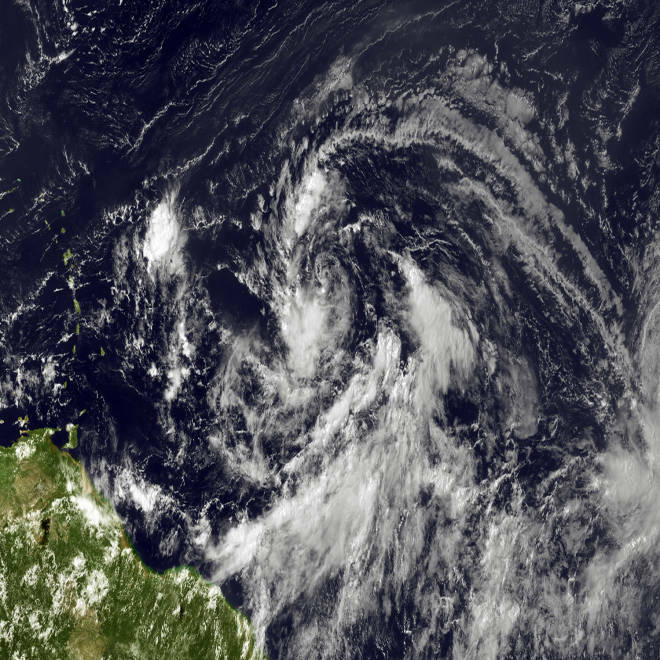 A tropical storm watch was issued for the British and U.S. Virgin Islands and Puerto Rico. Forecasters caution that long-range storm track predictions can be off by hundreds of miles. A hurricane hunter plane flew into the system Tuesday and found a small area of tropical-storm force winds associated with thunderstorms just outside the center of circulation, The Weather Channel reported. Thousands of Republicans will gather in Tampa next week to nominate Mitt Romney for president and Paul Ryan for vice president. GOP and Tampa officials say they have contingency plans in case a storm blows through. This article include reporting by The Associated Press.